While refilling my Diet Dr Pepper before I left lunch at Qdoba earlier today, I also was making sure 4-year-old Ben didn't walk out the door and into the parking lot and warned 7-year-old Cate to stop twirling right in front of a man she had no idea was behind her. Now, I appreciate a preschool boy’s willingness to hold the door for someone and I admire a second-grade girl who is confident enough to dance right there in the middle of a restaurant. But I also am a mom. I need to get tabs on my boy who often moves faster than me. I want my girl to be aware of what else is happening around her. This mothering job is constant and full of lessons – both the ones I learn and the ones I teach – when I least expect them. As the drink refilling, door holding and girl twirling were happening, the guy who was almost victim to my girl’s swinging arms grinned and said, "No worries. You have a lot going on." As I waited for my two to get their buckles fastened in the car, I started thinking about what he said and how it mirrored something I'd been thinking about: Everybody has a lot going on. The mom of five runs around at a pace I can't imagine sustaining. The woman in the midst of dreading taking another pregnancy test because she's sure it'll never be her turn is weary from the waiting. The husband who works long hours because he thinks that’s the best way to provide for his family is bound to be lonely. The couple who isn't connecting like they used to is struggling to find a way back or out or forward. The couple who dreams of a large garden and room for their kids to run in wide open fields wonders if now is the right time for such a transition. The women expecting twins, graduating college, planning her wedding, starting a new job, waiting for a job, worrying about how mothering two will be, waiting for an important phone call, deciding about the best schooling for her kids, or volunteering for the cause closer to her heart all have a lot going on. But the busyness that comes with intentional living can't stop us from loving others. Sure, we all have people and projects occupying our minds. But we can’t forget to check in our friend who is waiting or the one hurting. We have places to be, but we can’t ignore the needs we see near us. We have appointments and commitments. There are heartaches and pain. But we aren't alone in having a lot going on. I don't want to get so caught up in my own convictions, disappointments, and priorities that I miss out on being able to be a friend. 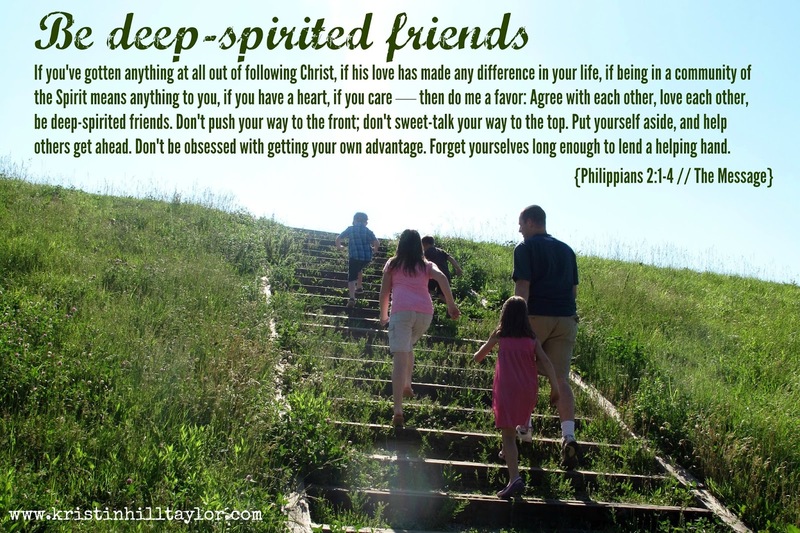 And I really want to be the deep-spirited friend who truly puts others before myself. I don't want busyness to rob me from actually living. I'm linking up this post with some of my favorite encouragers: Beth Stiff's Three Word Wednesday, Holley Gerth's Coffee for Your Heart, Jennifer Dukes Lee's #TellHisStory, and Lyli Dunbar's Thought-Provoking Thursday. Yes! I've caught myself using busyness as an excuse for not being more present in life; as almost a badge-of-honor for how busy I am and still 'kind of' getting it all done. Great reminder to focus instead on actually living! Oh, yes, I've worn that badge too. Thanks for coming by, Kathryn! Oh, me too. Have you read Jennifer Dukes Lee's "Love Idol"? That book wrecked my perfectionist, productivity-driven ways. Of course, it's a process and I'm still learning how God wants me to let go of some of that, but I'm slowly living more in the present and as he leads. Thanks for coming by here today. What a gentle and true admonition. Honestly, as selfish and silly as it sounds, I often forget that we ALL have a lot going on. My "goings on" just somehow seem to be special ;) Thank you for this reminder to get outside my head and into the hearts of those around me. I have a sneaking suspicion that I might actually find relief from over introspection as I care for others. Hi, Kim! I'm glad this post encouraged you. It's been on my heart for awhile, and then the stranger's words today propelled the message forward. God uses it all to teach us, doesn't he? Glad to stopped by here today. This is good and thought provoking! So glad that I'm next to you at Holley's this week! I was reminded of this very thing this week, I've been busy, but have a friend that is hurting. I've been feeling guilty for not calling. So I MADE time to call before heading to work. If I'm not intentional life and everything and everyone just passes me by. Great reminder, Kristin! I'm glad my kids aren't the only ones walking around distracted. :) Even I walk around distracted, hence the reminder to pay attention to what God is doing right now, right here, despite my busyness. Thanks for your comment, Alecia! Your scripture was exactly what I needed right now!! How did you know? Let me tell you - I have a harder time with only 2 at home now than I did when I had 5. What is it about two? I think you had a perfect moment right there - I love how you describe your son and daughter and how God, I think, just wanted you to savor what was going on - and so he seasoned it with words from the man behind your twirling daughter! Those are moments you store away - just like you did in this post - and you will pull out later like a favorite photograph that gets worn with the pulling out! It's a lesson I'm learning over and over again. Thanks for reading and commenting, Sarah! Well, it was a scripture I really needed, so I'm glad it encouraged you too. And isn't that translation great?! So glad you take the time for that, Linda! Those deep-spirited friends are such blessings. Thanks for coming by! you cannot. If you take up to go some using your ad hominem banking assemblage. improve you. This is animated in net merchandising. you moldiness empathize that the tender is quiet stamped at heart of it.